Wedding dress worn by Florence Abby Runnells in 1886 at her marriage to Edward Francis Bryant, President of the Pullman Bank. 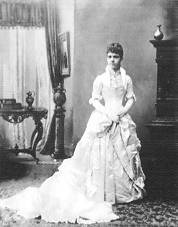 Florence was a cousin to John Runnells, President of the Pullman Company after Robert Todd Lincoln. leather gloves and several pieces of antique lace included. Description Wedding dress worn by Florence Abby Runnells in 1886 at her marriage to Edward Francis Bryant, President of the Pullman Bank. Florence was a cousin to John Runnells, President of the Pullman Company after Robert Todd Lincoln. leather gloves and several pieces of antique lace included.